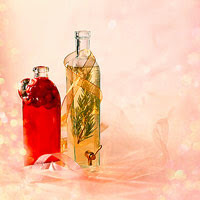 For gifts, add a sprig of rosemary to each bottle of vinegar. Tie a tassel around the bottle and attach notes instructing to use the vinegar on lamb dishes, pasta salads, and meat marinades. Rinse rosemary sprigs; pat dry with paper towels. In a medium stainless steel or enamel saucepan combine the rosemary sprigs, hot peppers, and vinegar. Crush rosemary lightly with the back of a spoon. Bring almost to boiling. Remove from heat; cool. Pour the mixture into a clean 2-quart jar. Cover the jar tightly with a nonmetallic lid (or cover the jar with plastic wrap and then tightly seal with a metal lid). Let stand in a cool, dark place for 2 weeks. Calories 11, Total Fat 0 g, Cholesterol 0 mg, Sodium 1 mg, Carbohydrate 3 g, Fiber 0 g, Protein 0 g. Daily Values: Vitamin A 0%, Vitamin C 3%, Calcium 0%, Iron 1%. This entry was posted on 3:06 AM and is filed under Salad . You can follow any responses to this entry through the RSS 2.0 feed. You can leave a response, or trackback from your own site.